I am LOVING this book so far. I've heard nothing but awesome reviews regarding this story and I'm so glad that I finally found it! Trying to buy this book has been treacherous! Borders never had it. B&N didn't stock it, and I am such an instant gratification girl that I when I want something I want it NOW! So finally the other day, when I went in hunt for Splendor (which was Monday and they hadn't put it out yet). So I so that they finally had it and had to scoop it up! If you haven't read this book, I say go and get it. I'm not nearly finished with it, but OMIGOD, it's so good. And a little aside, I met Maria at BEA, but not because she was signing, because she was WAITING IN LINE to get Justine Larbalestier's book, Liar signed! She was so cool and talked to us for the whole time we waited. I've e-mailed her back and forth and she really is the sweetest person. So if you have a chance to see her at a signing, GO! You will be rewarded! Nice choice. I love the cover. I liked, but didn't love the Study series, and Maria's doing a signing in my town in January so I'll definitely be heading over there to meet her. 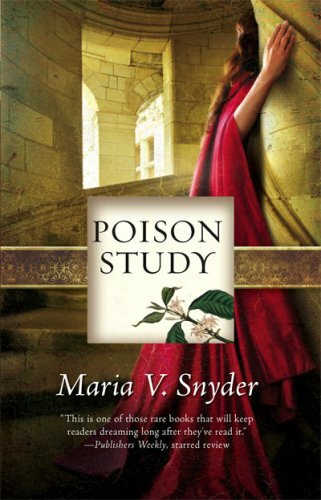 I LOVE the STUDY books, though Poison is by far the best one. And I still haven't gotten my hands on Splendor! Dumb Amazon is taking forever to ship! Wow, what a great, ringing endorsement! What fun! I love the cover--very provocative. And what a neat occurrence, to get to chat with her in line. Great week for books.